New Netherland ( Dutch: Nieuw Nederland; Latin: Nova Belgica or Novum Belgium) was a 17th-century colony of the Dutch Republic that was located on the east coast of America. The claimed territories extended from the Delmarva Peninsula to southwestern Cape Cod, while the more limited settled areas are now part of New York, New Jersey, Delaware, and Connecticut, with small outposts in Pennsylvania and Rhode Island. In 1609, English sea captain and explorer Henry Hudson was hired by the Dutch East India Company (VOC) located in Amsterdam  to find a Northeast Passage to Asia, sailing around Scandinavia and Russia. He was turned back by the ice of the Arctic in his second attempt, so he sailed west to seek a Northwest Passage rather than return home. He ended up exploring the waters off the east coast of North America aboard the Flyboat Halve Maen. His first landfall was at Newfoundland and the second at Cape Cod. The States General issued patents in 1614 for the development of New Netherland as a private, commercial venture. Soon thereafter, traders built Fort Nassau on Castle Island in the area of present-day Albany up Hudson's river. The fort was to defend river traffic against interlopers and to conduct fur trading operations with the natives. The location of the fort proved to be impractical, however, due to repeated flooding of the island in the summers; it was abandoned in 1618,  which coincided with the patent's expiration. 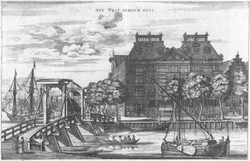 The Dutch West India Company (WIC) (Geoctroyeerde Westindische Compagnie) was granted a charter by the Republic of the Seven United Netherlands on June 3, 1621. It was given the exclusive right to operate in West Africa (between the Tropic of Cancer and the Cape of Good Hope) and the Americas. In New Netherland, profit was originally to be made from the North American fur trade. The Algonquian Lenape population around New York Bay and along the Lower Hudson were seasonally migrational people. The Dutch called the numerous tribes collectively the River Indians,   known by their exonyms as the Wecquaesgeek, Hackensack, Raritan, Canarsee, and Tappan. These groups had the most frequent contact with the New Netherlanders. The Munsee inhabited the Highlands, Hudson Valley, and northern New Jersey,  while Minquas (called the Susquehannocks by the English) lived west of the Zuyd Rivier along and beyond the Susquehanna River, which the Dutch regarded as their boundary with Virginia. The earliest Dutch settlement was built around 1613, and consisted of a number of small huts built by the crew of the "Tijger" (Tiger), a Dutch ship under the command of Captain Adriaen Block, which had caught fire while sailing on the Hudson. Soon after, the first of two Fort Nassaus was built, and small factorijen or trading posts went up, where commerce could be conducted with Algonquian and Iroquois population, possibly at Schenectady, Esopus, Quinnipiac, Communipaw, and elsewhere. In 1617, Dutch colonists built a fort at the confluence of the Hudson and Mohawk Rivers where Albany now stands. 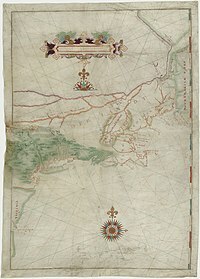 In 1624, New Netherland became a province of the Dutch Republic, which had lowered the northern border of its North American dominion to 42 degrees latitude in acknowledgment of the claim by the English north of Cape Cod. [nb 1] The Dutch named the three main rivers of the province the Zuyd Rivier ( South River), the Noort Rivier ( North River), and the Versche Rivier ( Fresh River). Discovery, charting, and permanent settlement were needed to maintain a territorial claim. To this end in May 1624, the WIC landed 30 families at Fort Orange and Noten Eylant (today's Governors Island) at the mouth of the North River. They disembarked from the ship New Netherland, under the command of Cornelis Jacobsz May, the first Director of the New Netherland. He was replaced the following year by Willem Verhulst. Peter Minuit became Director of the New Netherland in 1626 and made a decision that greatly affected the new colony. Originally, the capital of the province was to be located on the South River,  but it was soon realized that the location was susceptible to mosquito infestation in the summer and the freezing of its waterways in the winter. He chose instead the island of Manhattan at the mouth of the river explored by Hudson, at that time called the North River. 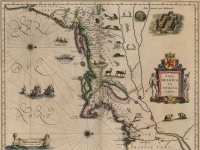 In the hope of encouraging immigration, the Dutch West India Company established the Charter of Freedoms and Exemptions in 1629, which gave it the power to offer vast land grants and the title of patroon to some of its invested members. The vast tracts were called patroonships, and the title came with powerful manorial rights and privileges, such as the creation of civil and criminal courts and the appointing of local officials. In return, a patroon was required by the Company to establish a settlement of at least 50 families within four years  who would live as tenant farmers. Of the original five patents given, the largest and only truly successful endeavour was Rensselaerswyck,  at the highest navigable point on the North River,  which became the main thoroughfare of the province. Beverwijck grew from a trading post to a bustling, independent town in the midst of Rensselaerwyck, as did Wiltwyck, south of the patroonship in Esopus country. Willem Kieft was Director of New Netherland from 1638 until 1647. The colony had grown somewhat before his arrival but it did not flourish, and Kieft was under pressure to cut costs. At this time, a large number of Indian tribes which had signed mutual defense treaties with the Dutch were gathering near the colony due to widespread warfare and dislocation among the tribes to the north. At first, he suggested collecting tribute from the Indians,  as was common among the various dominant tribes, but his demands were simply ignored by the Tappan and Wecquaesgeek. Subsequently, a colonist was murdered in an act of revenge for some killings that had taken place years earlier and the Indians refused to turn over the perpetrator. Kieft suggested that they be taught a lesson by ransacking their villages. In an attempt to gain public support, he created the citizens commission the Council of Twelve Men. 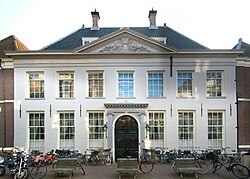 The Union of Utrecht, the founding document of the Dutch Republic, signed in 1579, stated "that everyone shall remain free in religion and that no one may be persecuted or investigated because of religion". 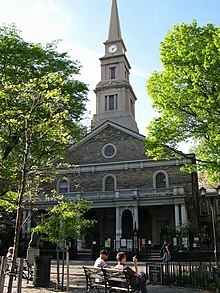 The Dutch West India Company, however, established the Reformed Church as the official religious institution of New Netherland. Its successor church, the Reformed Church in America still exists today. The colonists had to attract, "through attitude and by example", the natives and nonbelievers to God's word "without, on the other hand, to persecute someone by reason of his religion, and to leave everyone the freedom of his conscience." In addition, the laws and ordinances of the states of Holland were incorporated by reference in those first instructions to the Governors Island settlers in 1624. 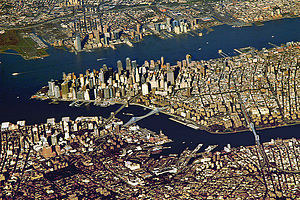 There were two test cases during Stuyvesant's governorship in which the rule prevailed: the official granting of full residency for both Ashkenazi and Sephardi Jews in New Amsterdam in 1655, and the Flushing Remonstrance, involving Quakers, in 1657. During the 1640s, two religious leaders, both women, took refuge in New Netherland: Anne Hutchinson and the Anabaptist Lady Deborah Moody. 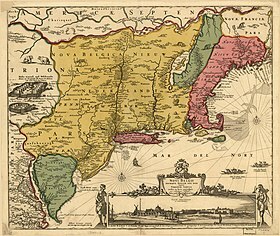 Initially, there was limited contact between New Englanders and New Netherlanders, but the two provinces engaged in direct diplomatic relations with a swelling English population and territorial disputes. The New England Confederation was formed in 1643 as a political and military alliance of the English colonies of Massachusetts, Plymouth, Connecticut, and New Haven. 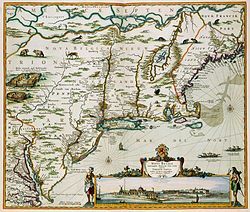 Connecticut and New Haven were actually on land claimed by the United Provinces, but the Dutch were unable to populate or militarily defend their territorial claim and therefore could do nothing but protest the growing flood of English settlers. 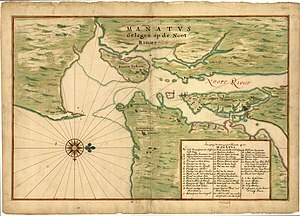 With the 1650 Treaty of Hartford, Stuyvesant provisionally ceded the Connecticut River region to New England, drawing New Netherland's eastern border 50 Dutch miles (approximately 250 km) west of the Connecticut's mouth on the mainland and just west of Oyster Bay on Long Island. The Dutch West India Company refused to recognize the treaty, but it failed to reach any other agreement with the English, so the Hartford Treaty set the de facto border. Connecticut mostly assimilated into New England. On August 27, 1664, four English frigates led by Richard Nicolls sailed into New Amsterdam's harbor and demanded New Netherland's surrender. They met no resistance because numerous citizens' requests had gone unheeded for protection by a suitable Dutch garrison against "the deplorable and tragic massacres" by the natives. 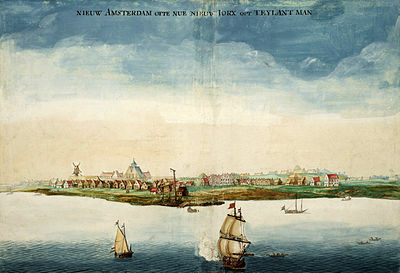 That lack of adequate fortification, ammunition, and manpower made New Amsterdam defenseless, as well as the indifference from the West India Company to previous pleas for reinforcement of men and ships against "the continual troubles, threats, encroachments and invasions of the English neighbors." Stuyvesant negotiated successfully for good terms from his "too powerful enemies". In the Articles of Transfer, he and his council secured the principle of religious tolerance in Article VIII, which assured that New Netherlanders "shall keep and enjoy the liberty of their consciences in religion" under English rule. The Articles were largely observed in New Amsterdam and the Hudson River Valley, but they were immediately violated by the English along the Delaware River, where pillaging, looting, and arson were undertaken under the orders of English officer Sir Robert Carr, Kt. who had been dispatched to secure the valley. Many Dutch settlers were sold into slavery in Virginia on Carr's orders, and an entire Mennonite settlement led by Pieter Corneliszoon Plockhoy, was wiped out, near modern Lewes, Delaware. The 1667 Treaty of Breda ended the Second Anglo-Dutch War; the Dutch did not press their claims on New Netherland, and the status quo was maintained, with the Dutch occupying Suriname and the nutmeg island of Run. Many prominent U.S. citizens are Dutch American directly descended from the Dutch families of New Netherland. The Roosevelt family produced two Presidents and are descended from Claes van Roosevelt, who emigrated around 1650. The Van Buren family of President Martin Van Buren also originated in New Netherland. The Bush family descendants from Flora Sheldon are descendants from the Schuyler family. Early settlers and their descendents gave many placenames still in use throughout the region that was New Netherland. Using Dutch, and the Latin alphabet, they also " Batavianized"  names of Native American geographical locations such as Manhattan, Hackensack, Sing-Sing, and Canarsie. Peekskill, Catskill, and Cresskill all refer to the streams, or kils, around which they grew. Schuylkill River is somewhat redundant, since kil is already built into it. Among those that use hoek, meaning corner,  are: Red Hook, Sandy Hook, Constable Hook, and Kinderhook. Nearly pure Dutch forms name the bodies of water Spuyten Duyvil, Kill van Kull, and Hell Gate. Countless towns, streets, and parks bear names derived from Dutch places or from the surnames of the early Dutch settlers. 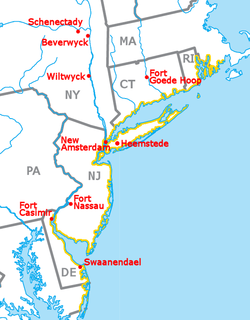 Hudson and the House of Orange-Nassau lend their names to numerous places in the Northeast.